This painting brings back some very fond memories of kitty-sitting for my daughter. 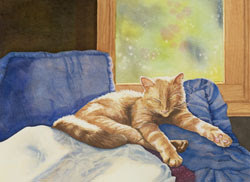 Trajan (Tra), her golden tabby, was sleeping in my bay window on some soft pillows when I snapped the reference photos for this piece. He is a pretty sleepy, relaxed cat and thoroughly enjoyed the bay window, which faces south and has sun shining through the windows all day. I am usually a pretty tight, exact painter, but I used a big wet-in-wet wash for the window of this piece. I wanted to create the impression that something was beyond, but I wanted all of the focus to be on Tray. I masked the bright white areas of sun-drenched fur, then painted layers of wet washes to create the golden, shadowed fur. If you would like to see this piece in a larger format, you can click here to visit the page on my website.